Sharjah - His Highness Dr Shaikh Sultan Bin Mohammad Al Qasimi, Supreme Council Member and Ruler of Sharjah and President of the University of Sharjah (UOS), yesterday inaugurated a Training Stock Market Simulator (TSMS) at the University of Sharjah. The opening was attended by Sultan Bin Saeed Al Mansouri, Minister of Economy, Abdullah Al Tarifi, CEO of the Securities and Commodities Authority (SCA), Professor Sami Mahmoud, Chancellor of UOS, and a number of college deans, faculty, administrative staff and students. Al Tarifi said that TSMS will help spread knowledge on financial investments among university students. The market will provide Business Administration students with the atmosphere of a real market, and will help them learn more about stock trading procedures such as when to buy and sell stocks. It will also help students learn when to close deals by relying on information provided by TSMS. TSMS was introduced as part of an MoU signed between SCA and UoS, and was set up in coordination between SCA and stock markets in the countries. 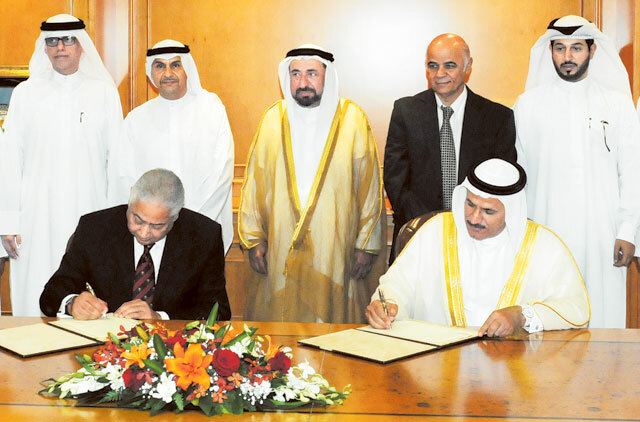 Dr Shaikh Sultan also attended a ceremony on the signing of a Memorandum of Understanding between the Ministry of Economy and the University of Sharjah on enhancing cooperation and coordination in areas of common interest. After that Al Mansouri announced a masters grants programme launched by the Securities and Commodities Authority in collaboration with the University of Sharjah. The MoU was signed by the Minister of Economy and Chancellor of UoS, and aims to strengthen cooperation and coordination in the fields of studies, research and the organisation of conferences, workshops and business consulting, training and human resource development between the two parties. Al Mansouri praised the keenness of Dr Shaikh Sultan to ensure the availability of all factors of success and excellence in the educational process of the university. He said that such efforts have made the university occupy a very prestigious position in the region.